Fractal Design, based in Gothenburg, Sweden is one of the leading manufacturers of PC cases, power supplies and cooling products in Europe. The company was founded in 2007 by a team of Swedish engineers who have carefully listened to the needs of customers. The company’s PC cases have won multiple awards and are renowned for combining high quality workmanship with striking design features, superior performance, and excellent value. 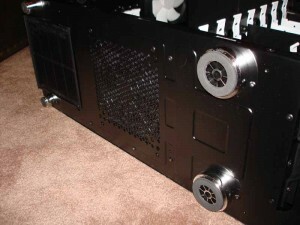 Supports PSU’s with a depth of maximum circa 170 mm, when using bottom 120/140 mm fan location. When not using the bottom 120/140 mm fan location, the case supports also longer PSU’s, typically 200-220 mm. 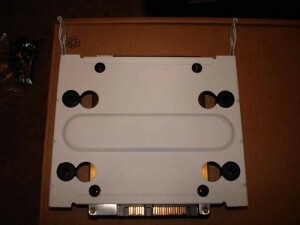 8x 3.5 inch HDD trays, compatible with SSD! The case arrived safely with only one ding on the top of the box, which didn’t have any effect on the contents. 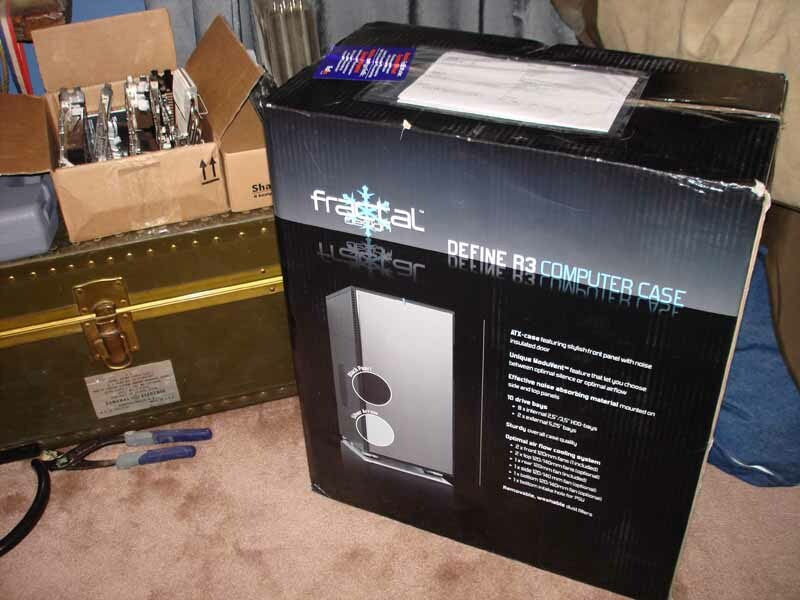 The packaging that Fractal Design used wasn’t quite the typical Styrofoam attached to two ends of the case. They used cardboard to form a “half box” and attached foam to the corners and in the middle of the cardboard. 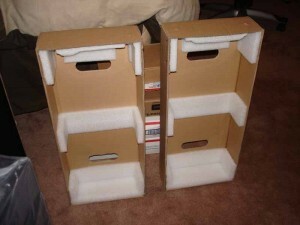 This method seems to work just well as all Styrofoam, except it’s probably cheaper to make. 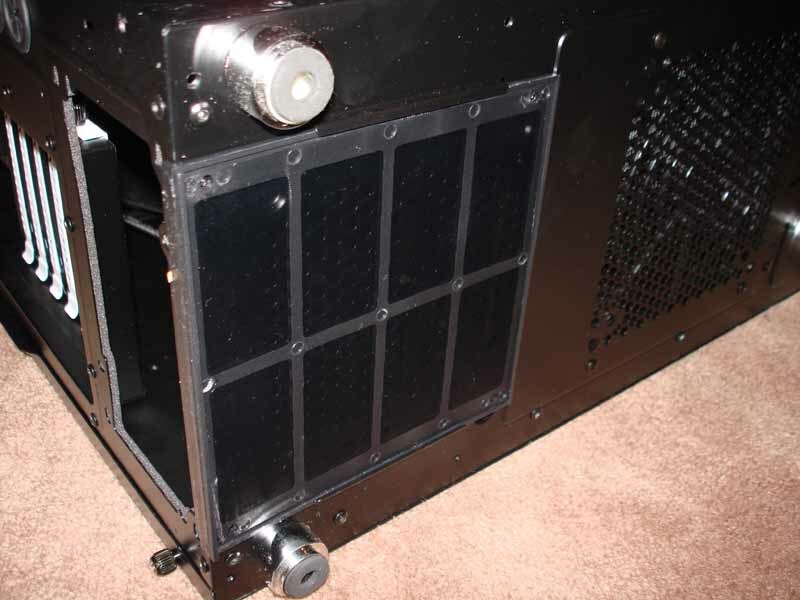 The accessories box includes mounting screws for the various components, zip ties for cable management, a faceplate for the front of the case when using a floppy drive, and a fan controller for up to three fans. I was curious as to how good the included fan controller would be since there wasn’t any info about the controller’s wattage rating, so I put it to the test. 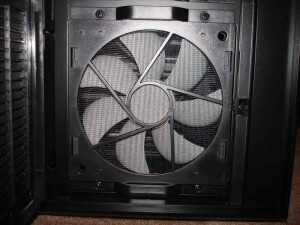 I tried Delta AFB1212SH fans rated for 6.24 W each. I tried just one fan at first and the controller handled it fine. Then, I added a second, and the only thing I noticed was slightly slower RPMs at the lowest setting. Next, I added a third, and again there was slightly slower RPMs at the lowest setting. So, on the lowest setting, the RPMs got increasingly slower with each fan added. When the fan controller is cranked to its maximum setting, it handles all three Delta fans flawlessly. 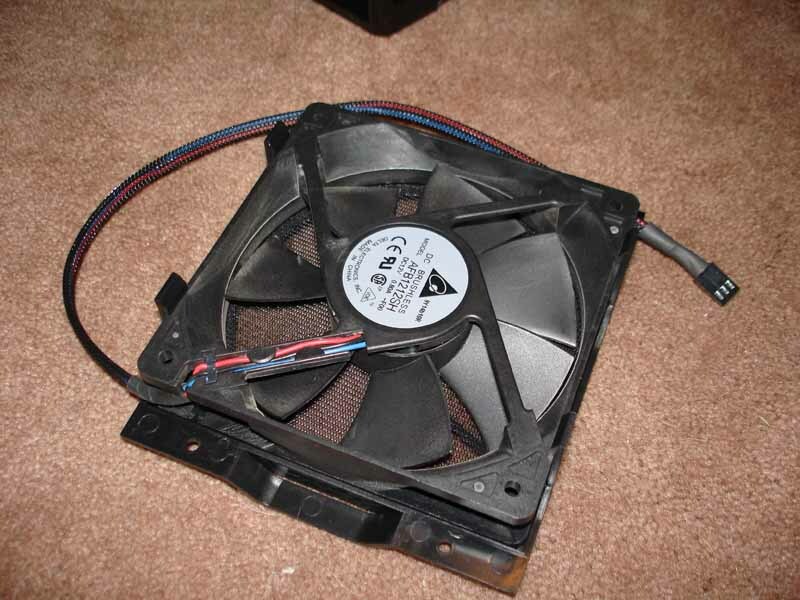 So, the controller can handle at least 18.72 W worth of fans, which exceeded my expectations of a fan controller that comes bundled with a case. Overall, the exterior of the Define R3 is sleek, simple, and loaded with features. Starting at the front of the case, there is a door which hides the 5.25″ bays and the front fan grills making the front look very clean. 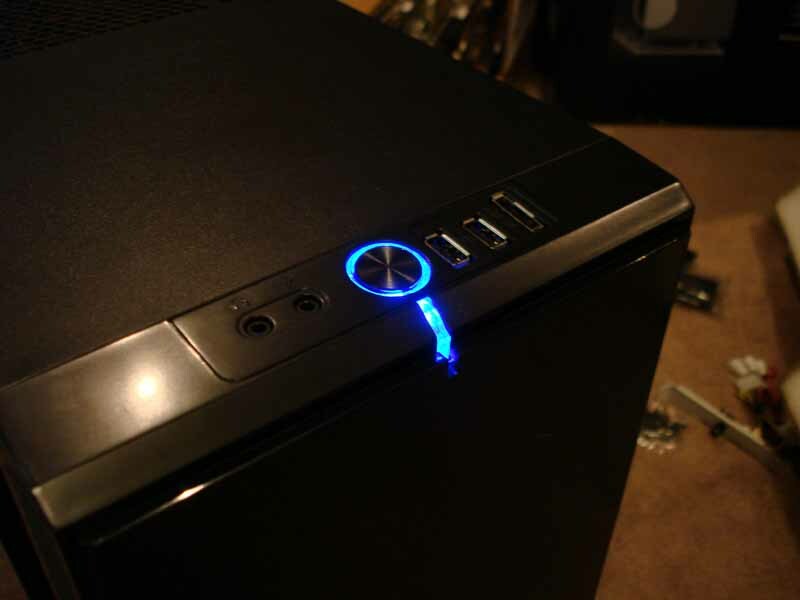 Unlike most front doors, Fractal Design uses strong magnets to keep the door closed instead of the clicking latches used by other companies. This allows for silent opening and closing of the door, and it removes a latch that could possibly break after continuous use. The inside of the front door is lined with foam for noise reduction. 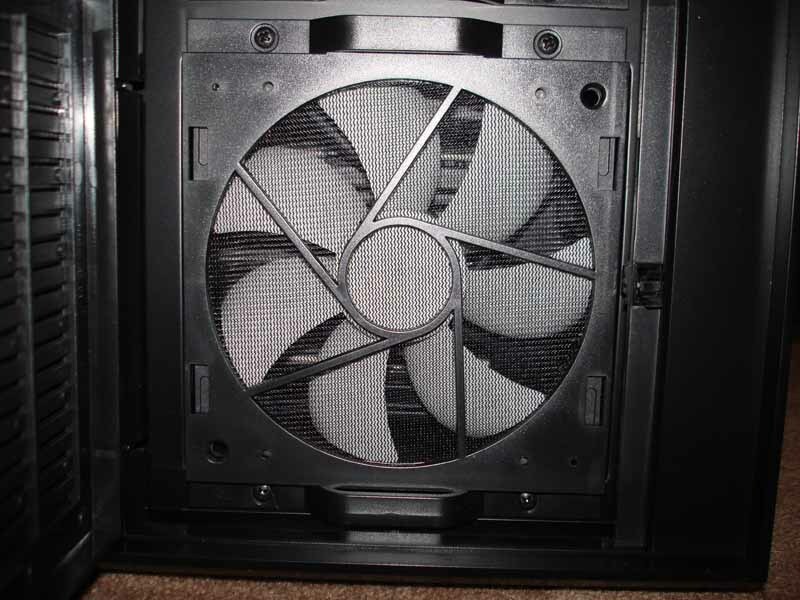 There are spots for two 120 mm front intake fans and one fan is included. 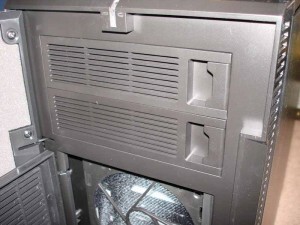 The intake fans are located behind their own doors which use the clicking latch to open and close. The fans are far enough away from the doors that a lot noise isn’t created by the fans pulling air out of the slotted vents. 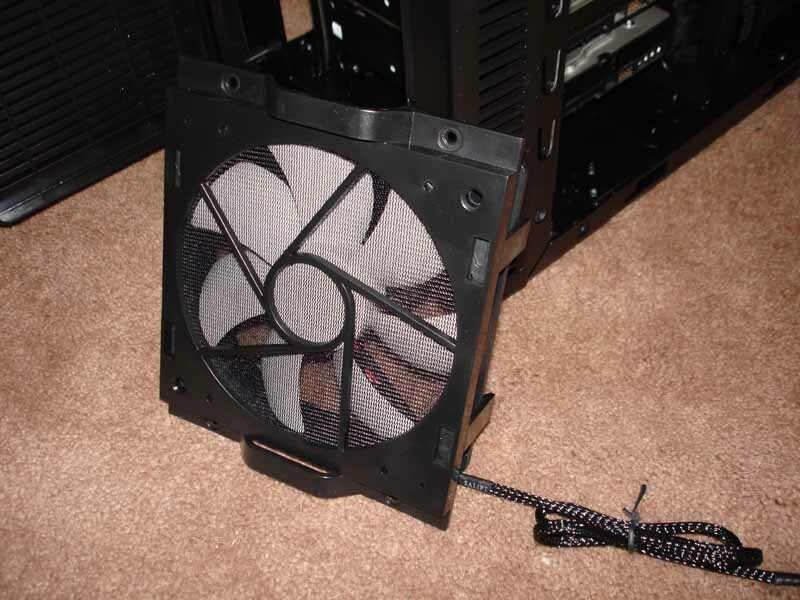 These intake fans also have dust filters installed on their mounting brackets, which is nice to keep dust off of the components which could increase heat. 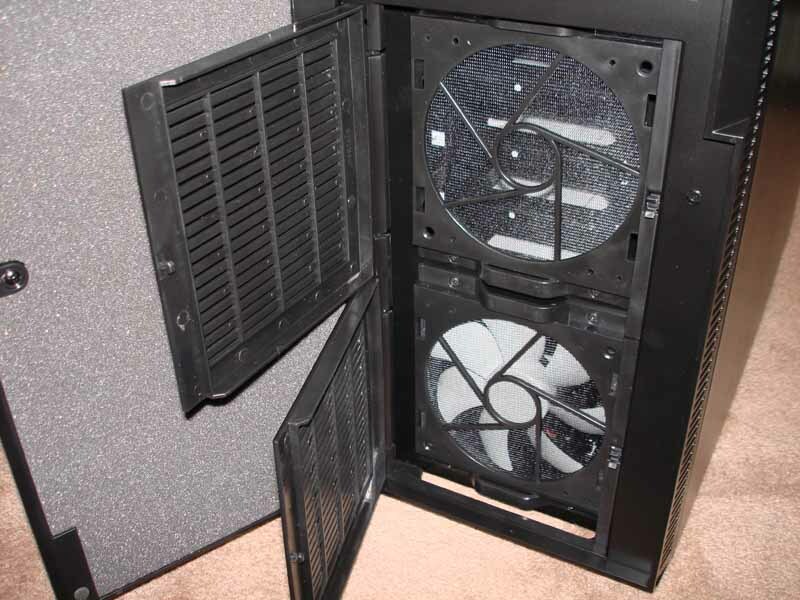 To remove the fans and clean the dust filters, there four screws which can be accessed from the front when the doors are open. Once the screws are removed, the fan and mounting bracket can be pulled out. The fans are attached to the brackets by tabs alone, which makes removing and swapping out fans very easy. There are two spots for 5.25” devices like optical drives. 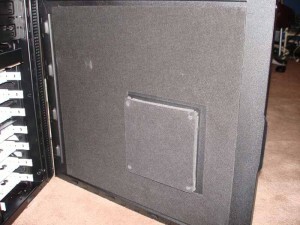 The bay covers are almost like doors as well. 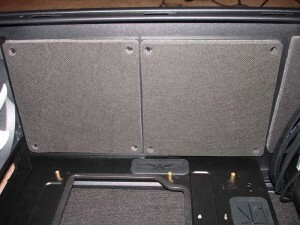 There are latches on the right side of the bay covers that lock them in place. 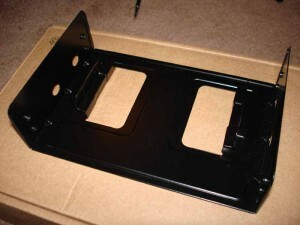 Once the latch is pulled, the covers open and can be pulled out for the installation of 5.25” devices. 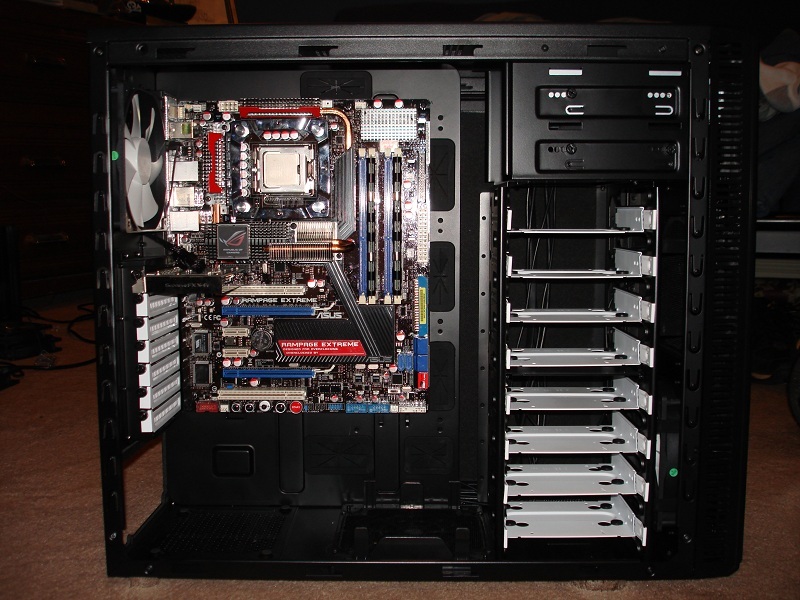 On to the left side panel, you’ll notice that there isn’t a window like a lot of “enthusiast” cases nowadays. Fractal Design isn’t going for the “bling” look with their cases; they are going for usability first and foremost. 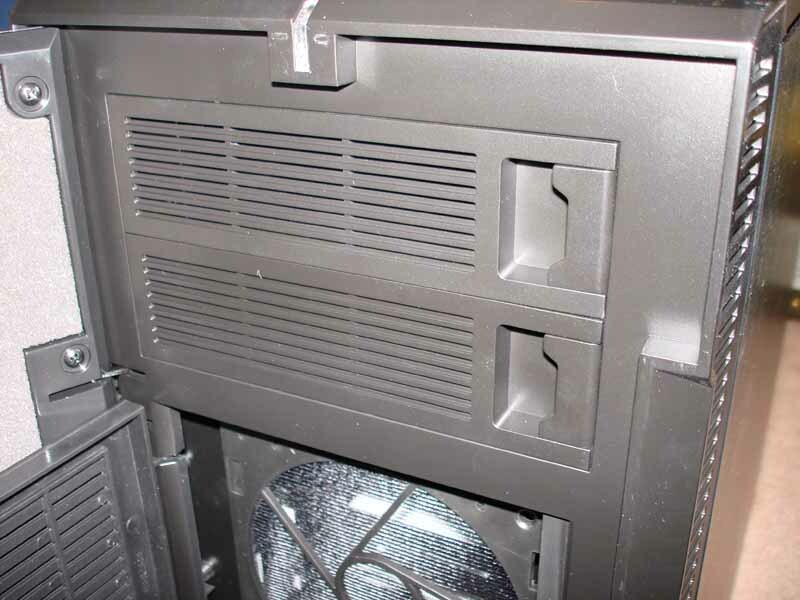 However, there is a spot for a 120 mm or 140 mm fan on the side panel, but notice that the fan grill is closed and not open like typical case vents. This is part of Fractal Design’s ModuVent™ design and will be touched on in more detail later. 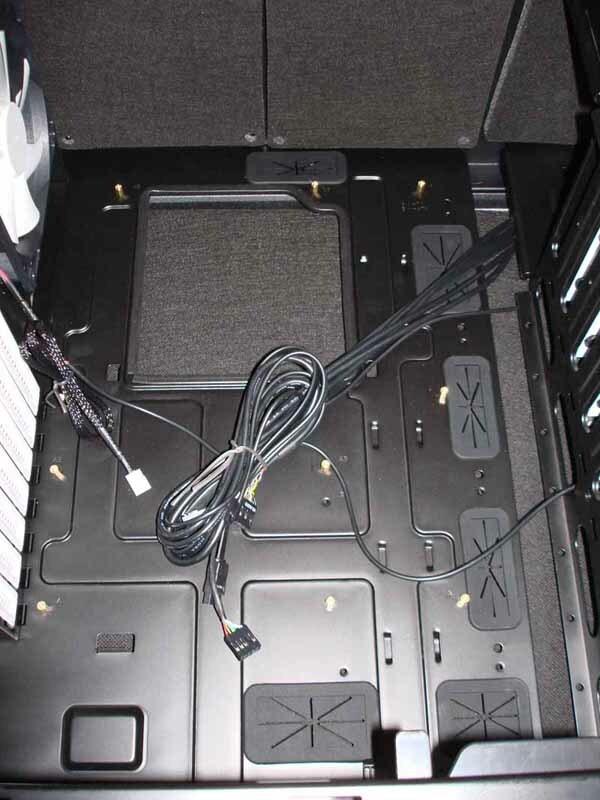 On the top of the case, there is the front panel I/O which includes a power switch, 2x USB2.0 ports, eSATA port, and audio I/O. 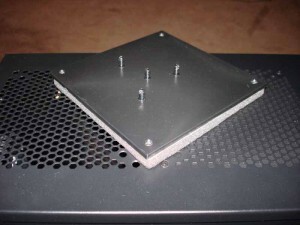 There are also two spots for 120 mm or 140 mm fans with the vents closed like the side panel vent, again this is the ModuVent™ design. 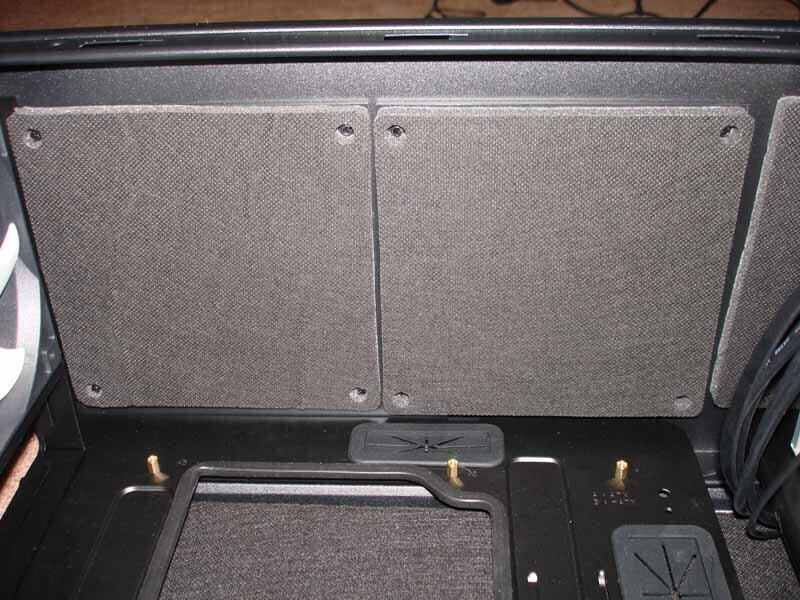 The bottom of the case even has a few features worth noting. 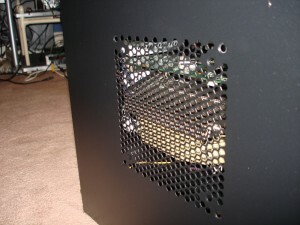 There are two vents on the bottom, one for the PSU and one for an optional 120 mm or 140 mm fan. 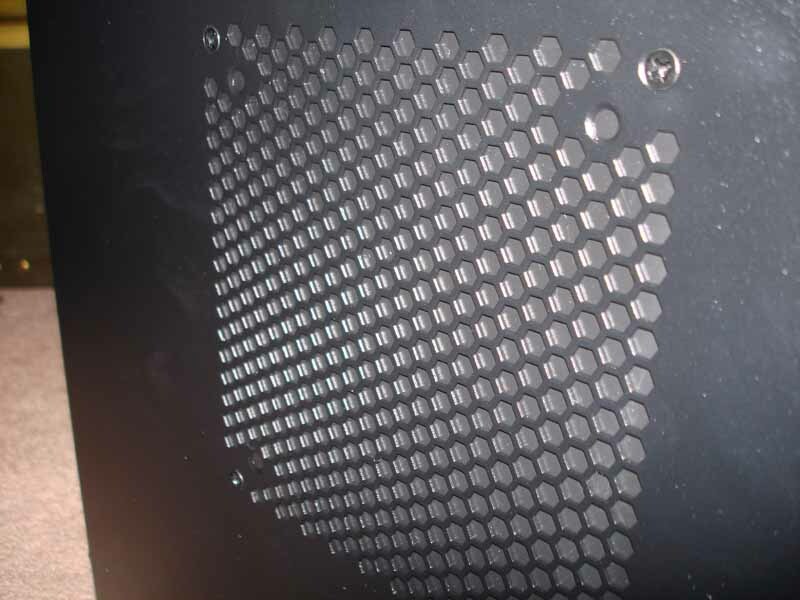 Covering the PSU vent is a removable dust filter to keep the PSU internals clean. 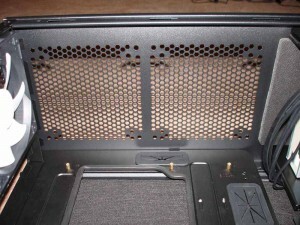 This filter is removed by pulling it out from the back of the case, so no need to lay down the case to clean the filter. 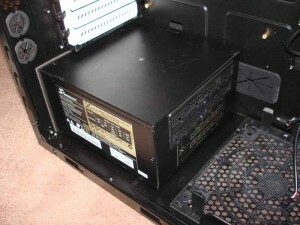 The case is held off the ground by four round, chrome feet to allow plenty of room for the PSU fan and the other optional fan to intake air. 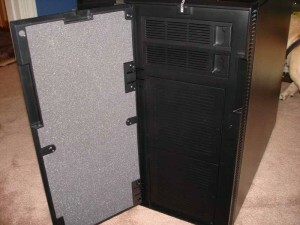 The back of the case is like most others with the exception of two features. 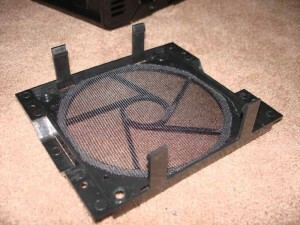 As mentioned in the previous paragraph, the dust filter for the PSU fan can be removed from the bottom by just sliding it out. The other not-so-typical feature is that there are two sets of holes with grommets for tubing in case there is an external radiator. One set is at the top, and the other set is on the right side. The contrasting white PCIe slot covers are a nice touch, and not to mention they are slotted for better airflow. 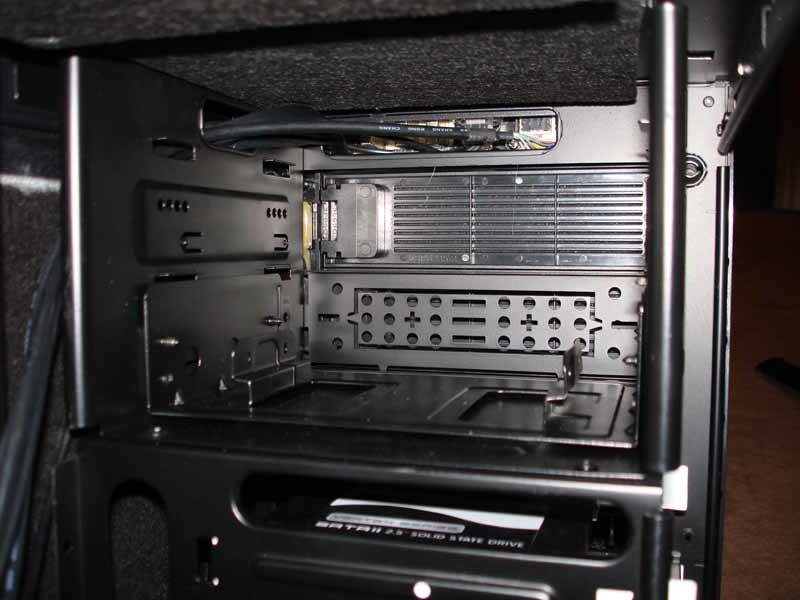 Now let’s take a look at the inside of the Define R3. 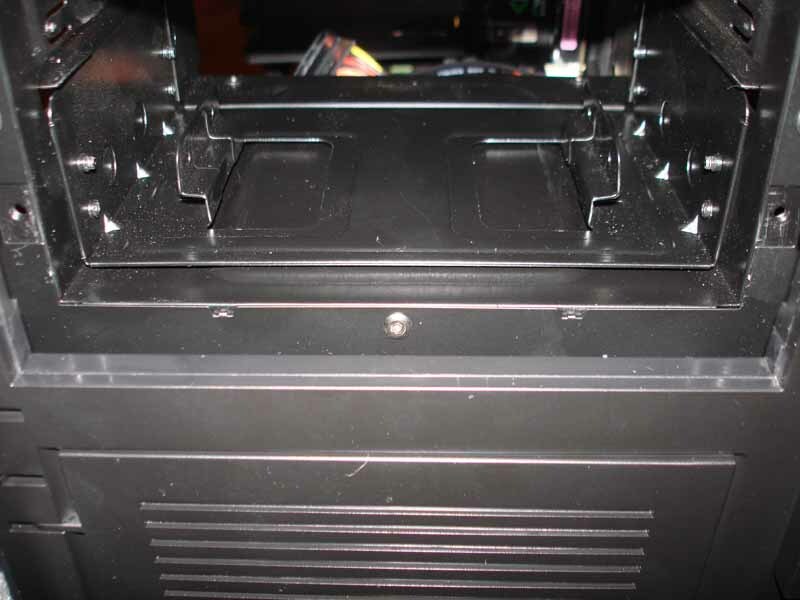 The first thing I wanted to check out when removing the side panel was the vent covers installed on the side and top of the case. Since I had never seen something like that I was very curious. 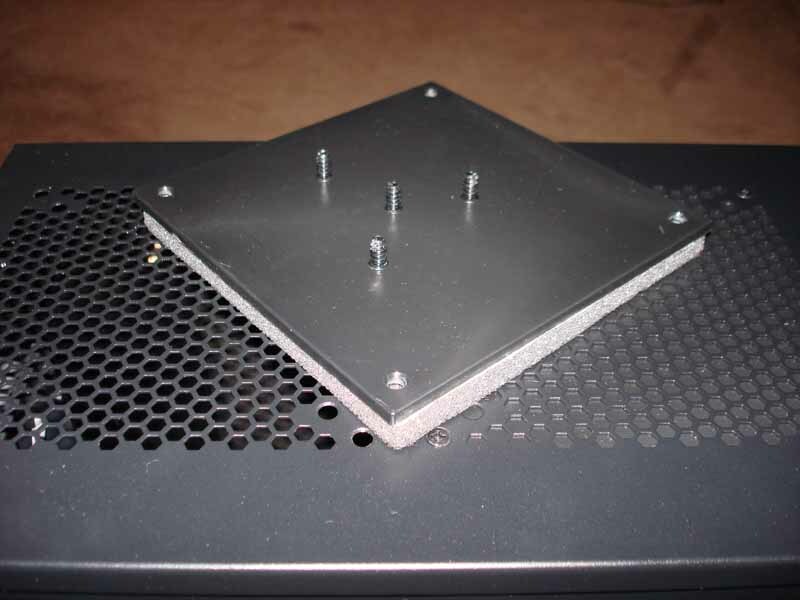 So, the ModuVent™ design uses plates, backed with foam, to cover various vents. 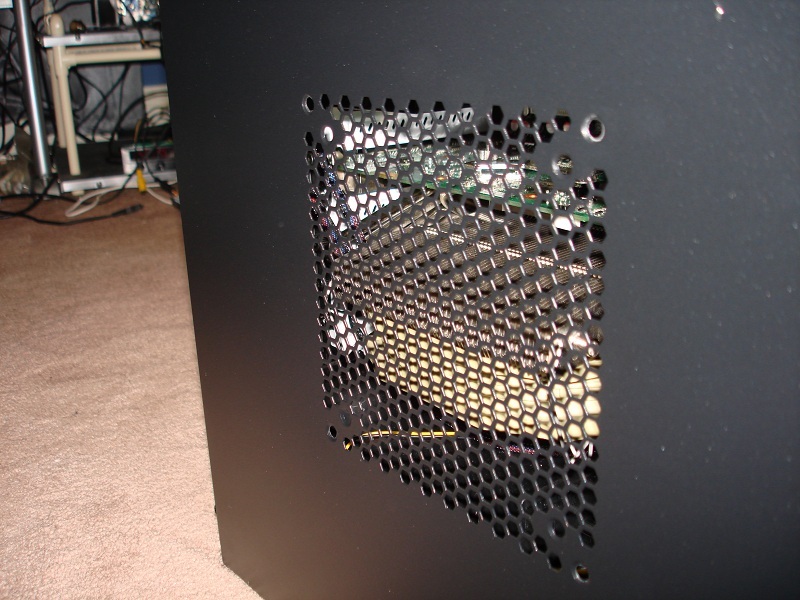 The purpose of this is to allow for regulating the performance to noise ratio of the case airflow, and it can also be used to direct airflow. 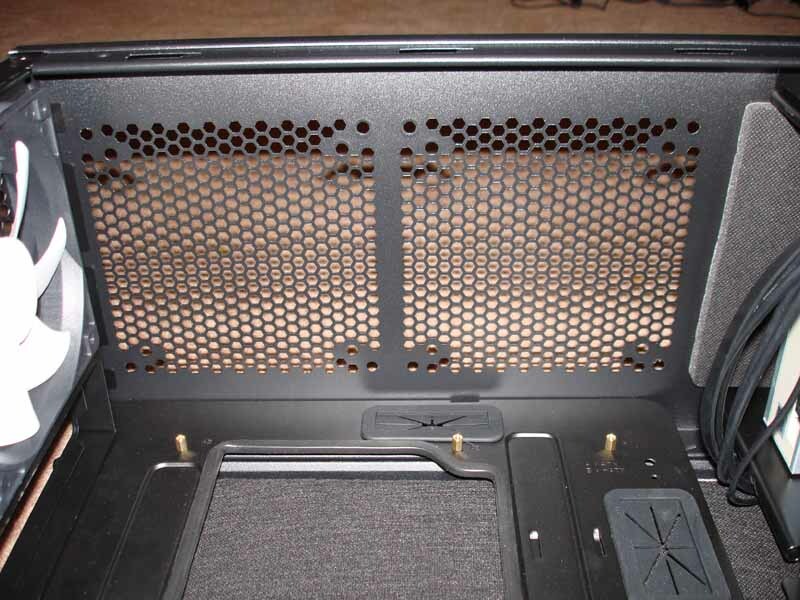 Covering all three of the vents nets the quietest performance since more noise is retained inside of the case. 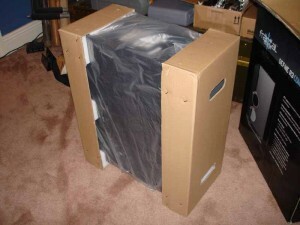 Removing vents increases noise, but it can also provide better cooling. 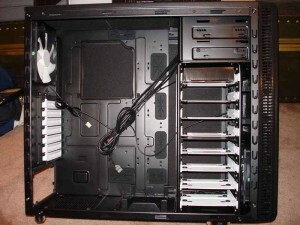 So the choice is up to the user to set up the airflow as he or she so chooses. 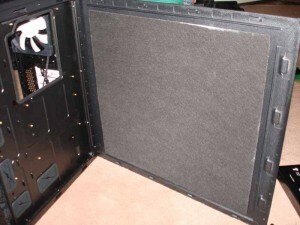 Both side panels have sound dampening material installed. 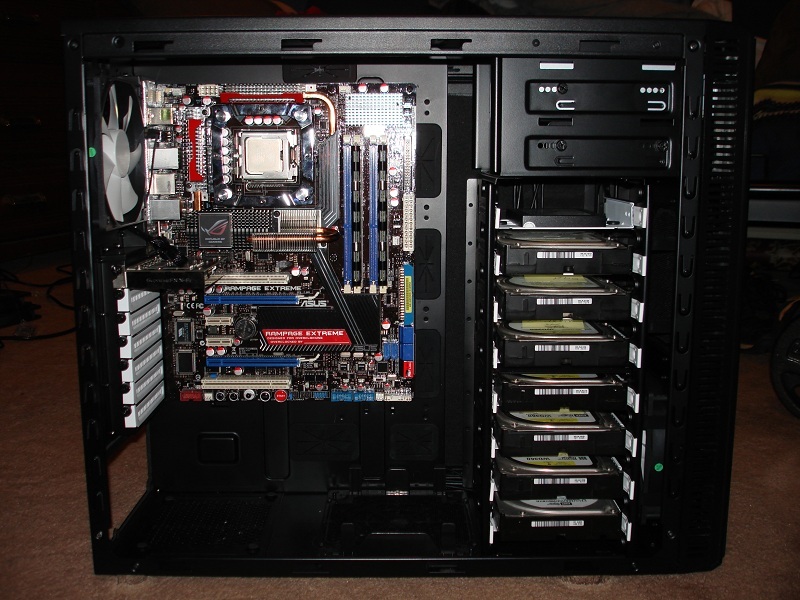 Sitting back and looking at the internals shows a majority black color scheme with contrasting white hard drive trays, PCIe slot covers, and fan blades. 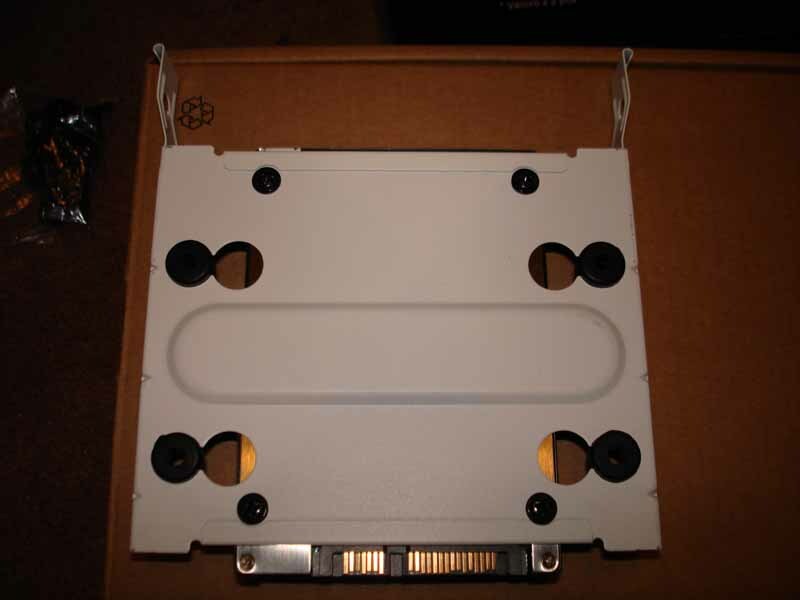 Taking a closer look at the motherboard tray, there are plenty of cable management holes for PSU cables, SATA cables, front panel connectors, etc. 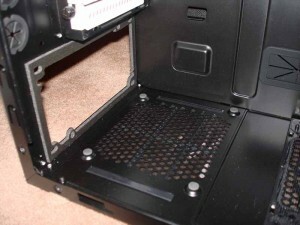 There’s also a hole for accessing the back plates of CPU coolers without having to remove the motherboard. 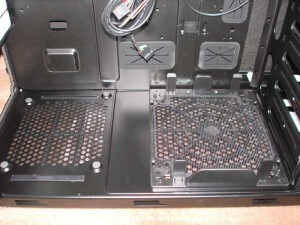 All of those holes are lined with rubber molding or grommets to protect cables and fingers. 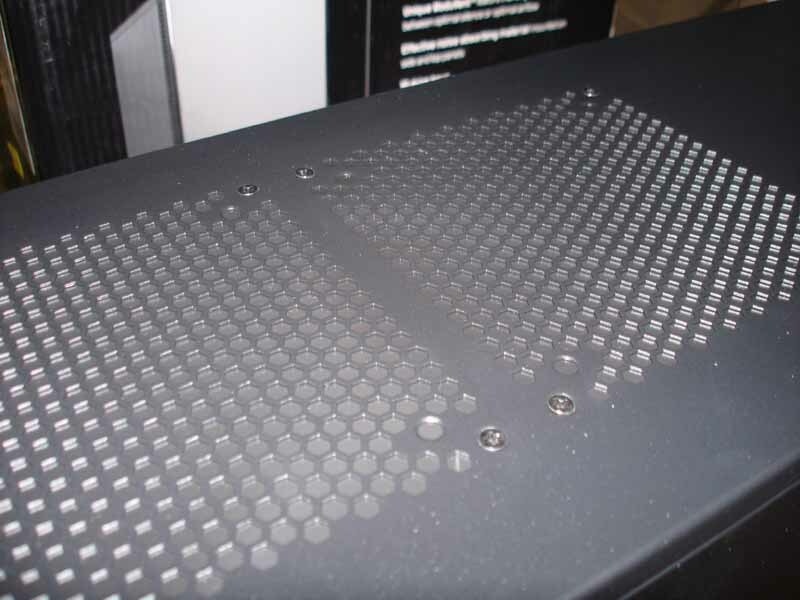 The PSU is isolated from metal to prevent noise from vibration; this is done by foam lining the mounting hole and four rubber pads on the bottom of the case. To the right of the PSU, there is a spot for mounting a 120 mm or 140 mm fan. 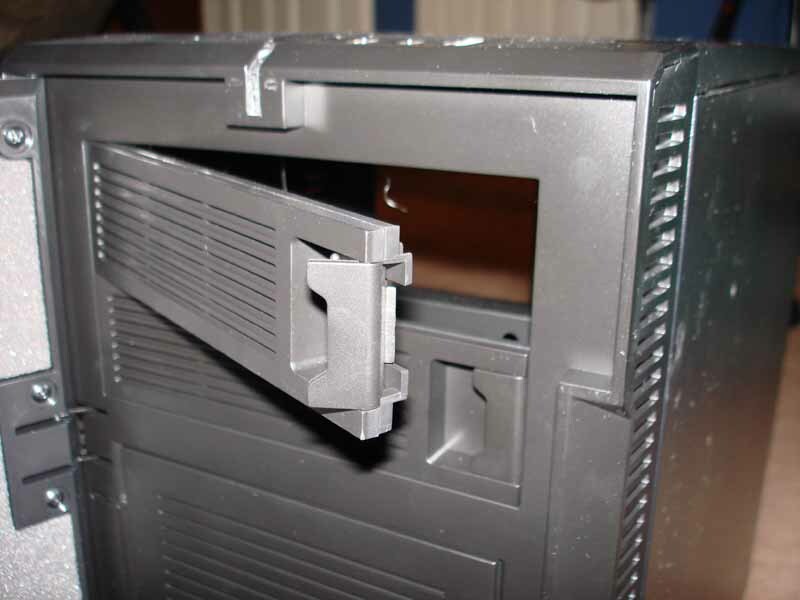 A 140 mm fan can be mounted by using the clip-on tabs, but a 120 mm will need to be secured with screws. 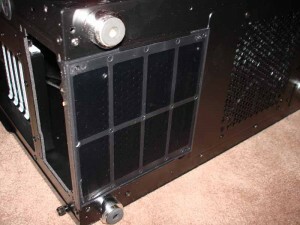 There’s also a dust filter installed for the optional bottom mounted intake fan. The hard drive cage can hold up to eight drives, which is a ton of drives, especially for the typical user. 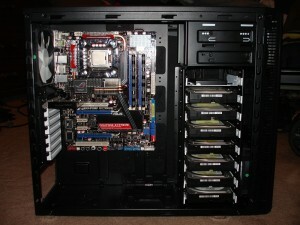 All of the drive trays support both 3.5” drives and 2.5” drives. When mounting 3.5” drives, there are four rubber grommets on the mounting holes that the drives sit on to absorb vibration and prevent noise. However, the 2.5” mounting holes do not have rubber grommets, and I think this is because Fractal-Design realizes that the majority of 2.5” drives installed in a desktop are solid state drives, which don’t create any vibration. 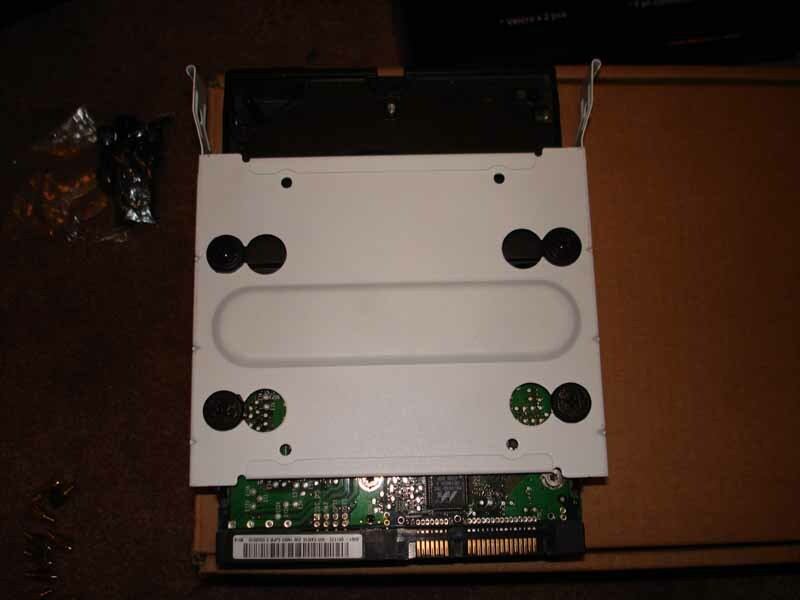 The drive trays are tool-less to remove, just pinch the tabs and pull, but the drives are attached to the trays by using four screws. 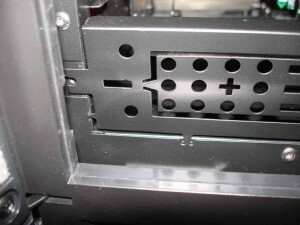 A feature that I think would have been nice to see would be allowing the bottom half of the hard drive cage to be removable. 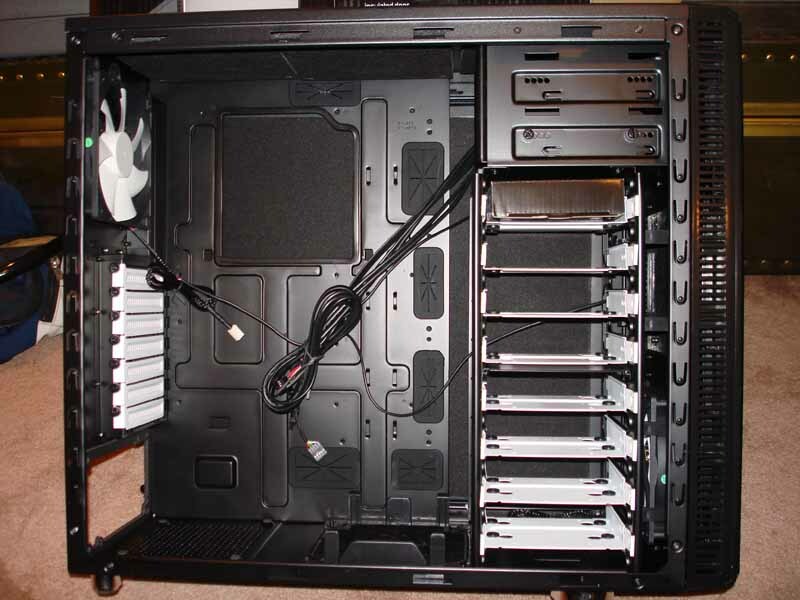 This would allow people who have just a few hard drives to remove the bottom portion for better airflow, and it would give people with non-modular PSUs somewhere to stash the unused cables. 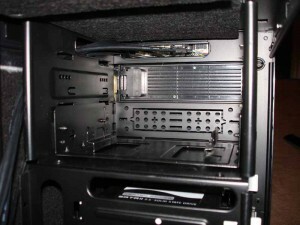 There are only two 5.25” bays in the Define R3, which could be a problem to some users. That leaves room for an optical drive and one other device, whether it’s another optical drive, floppy drive, card reader, etc. The bottom 5.25” bay comes with a 5.25” to 3.5” converter pre-installed for yet another hard drive (or floppy drive), which brings the total up to nine possible drives. Personally, I would have liked to see another 5.25” bay. I believe there are more users out there that use three 5.25” devices than users that need eight or nine hard drives. Plus, more 5.35” to 3.5” converters like the one supplied could be included if they think the ability to install more hard drives is necessary. The procedure for installing 5.25” devices is typical of other cases. The front cover needs to be removed, the device slides in from the front, and then secures with four thumb screws (two on each side). 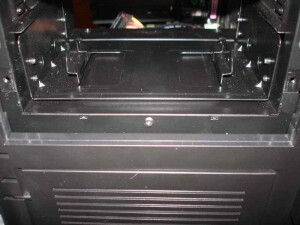 To install a device in the bottom 5.25″ bay, a floppy drive mounting bracket needs to be removed first. This bracket hasn’t been cut from the case metal yet, so it needs to be bent back and forth until it comes free. 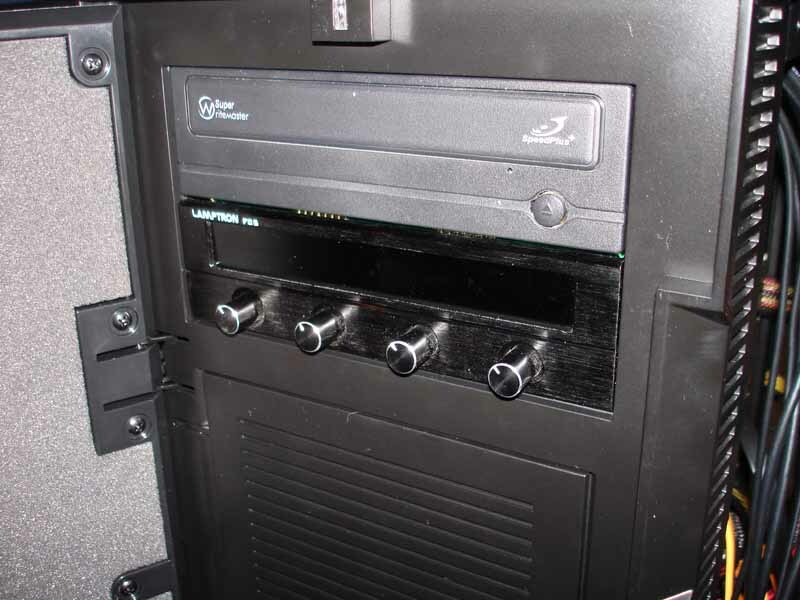 The major issue I have with front doors is that they cannot be closed if a fan controller bearing knobs is installed in a 5.25″ bay. 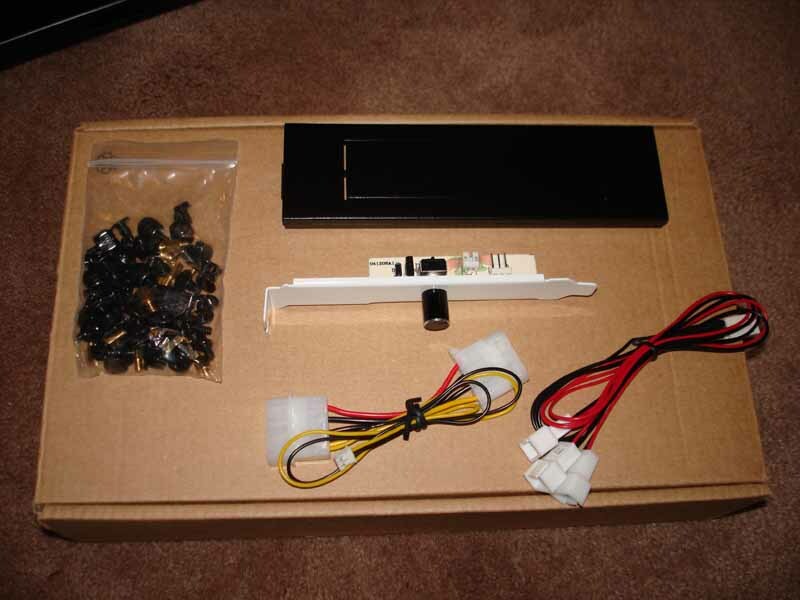 I’ll show what I mean by installing a Lamptron FC5V2 and trying to close the front door. Here are some pics of the components completely installed and ready for use. There are a few little things that caught my attention while putting this system together. The first was that every single screw in the case is black. 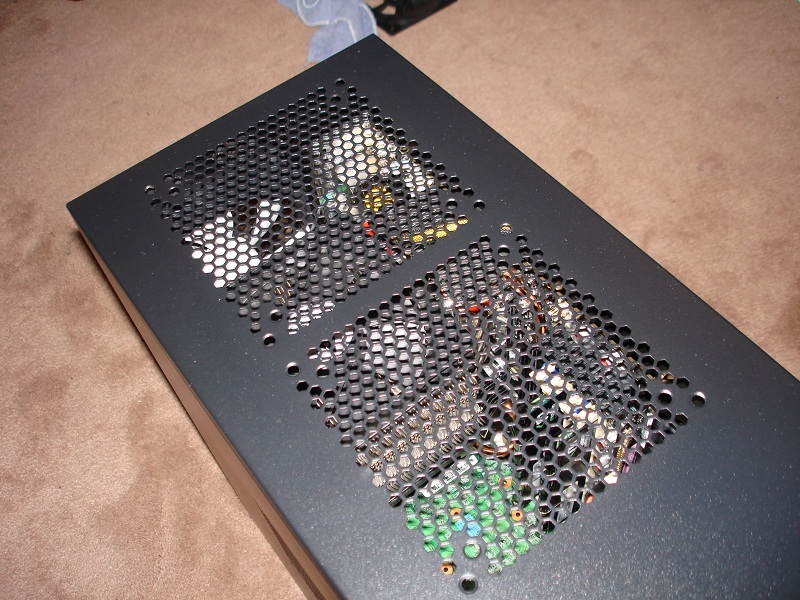 Next, The fan wires are sleeved, not only to stay within the color scheme, but to make for an overall clean look inside of the case. The front panel headphone and microphone 3.5 mm connectors are also lined in black instead of green and light red. 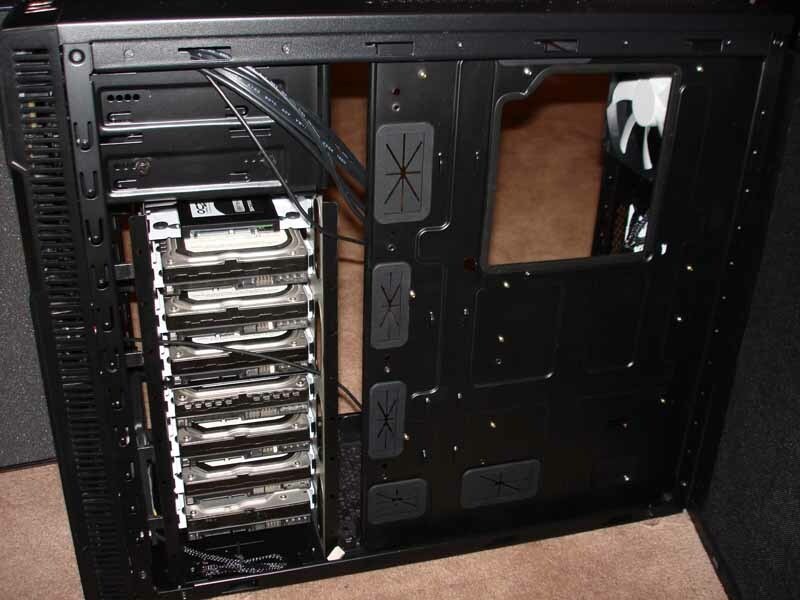 Even though the majority of the screws and fan wires will not be seen, especially without side window, Fractal Design made sure that everything matched the black/white color scheme. 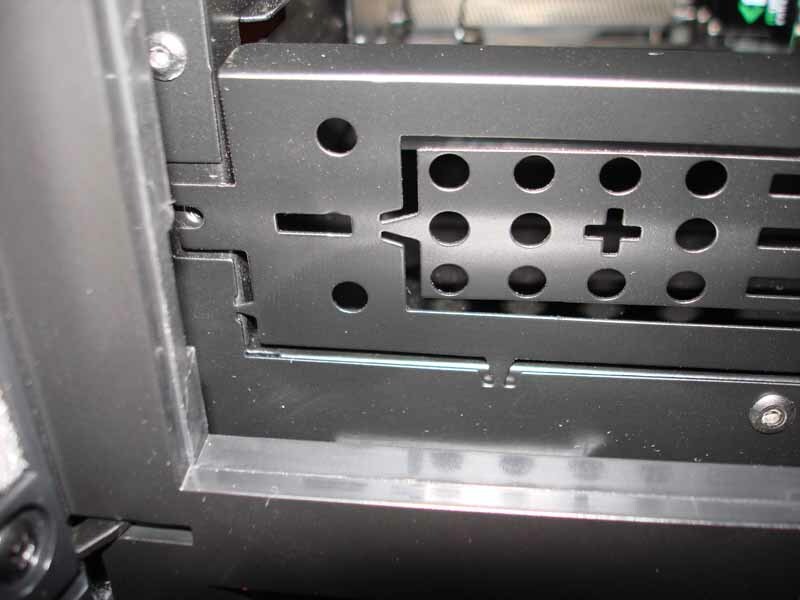 I really like how they decided to use thumbscrews for the PCIe slots rather than screws needing a screwdriver. 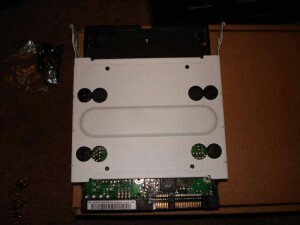 It makes for easy installation and removal of PCIe cards. Another nice detail is how the instructions for mounting the motherboard, 3.5” drives, and 2.5” drives are pressed into their respective trays. The only con that I think would affect all users is that only two fans are included with the Define R3. There are also a couple of issues that could affect a few users; there are only two 5.25” bays and the front door cannot close when a 5.25” bay fan controller with knobs is installed. Considering all of the features of the Define R3 and its price point at $110 on Newegg.com, I don’t think you can get a better case for the money. 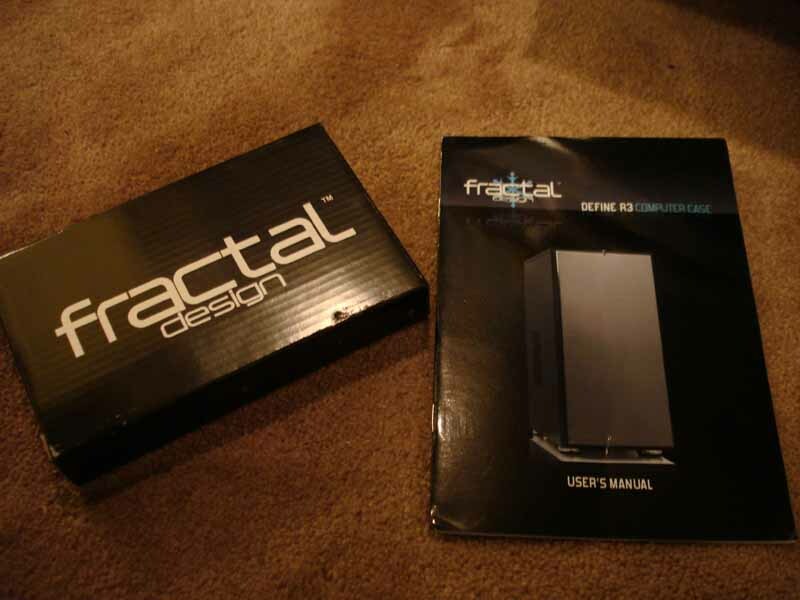 Fractal Design should definitely be considered by anyone in the market for a feature-rich, yet affordable, computer case. 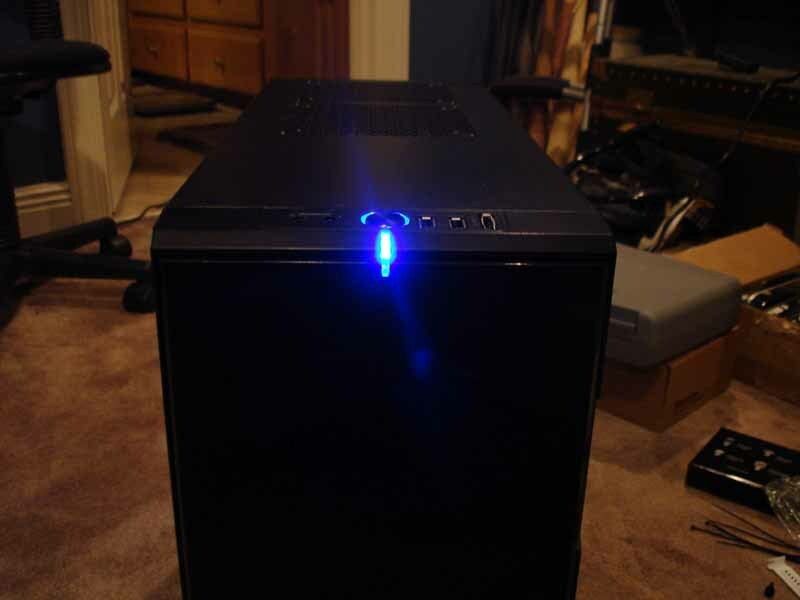 Really nice case, and I think the price seems about right - pretty reasonable with all the features. It has got some tough competition in this pricing bracket however, like the HAF932 - it sells on newegg for $140 right now with free shipping and a MIR (MIR brings the HAF932 price down to $120, but I hate mail in rebates). Shipping on the Define R3 is $15, so more or less, these cases almost work out to identical prices - which means buyers should decide which has the features and styling they prefer. Really fine looking case, and I like the finer touches included. Thanks for the writeup Matt! 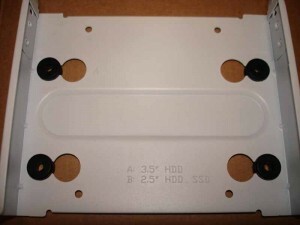 Rubber grommets or channel molding on the holes in the motherboard tray. 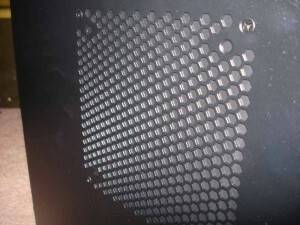 Dust filters on all of the intake fans. 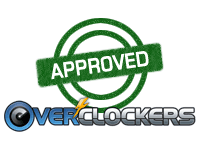 Strong single channel fan controller for 3 fans, even runs my Deltas! A few things I like about the HAF are pretty much the few cons of the Define R3. 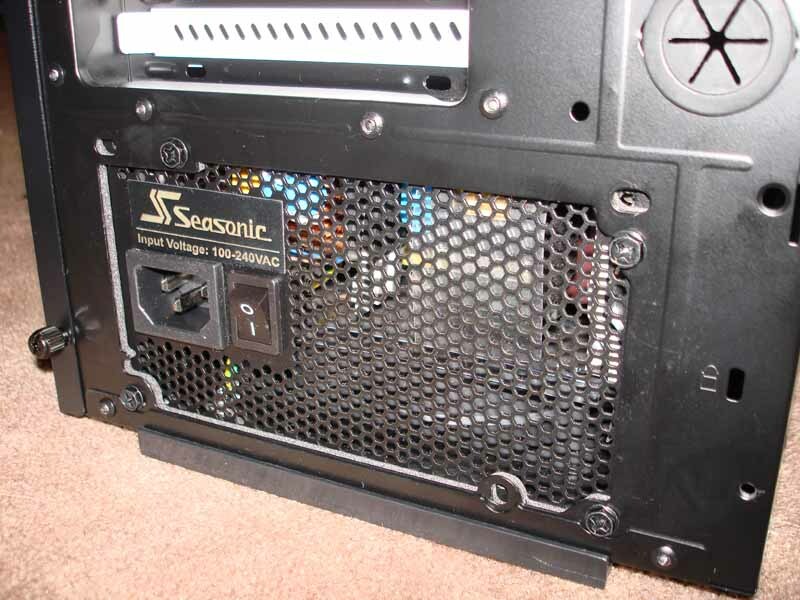 Installing a knobbed fan controller in a 5.25" bay without worrying about a door. Although, the door not quite closing on the R3 may or may not be that big of a deal to some people. Comes with more and better fans. Small window at the top of the side panel. Again, this is just my opinion and it comes down to what the customer is looking for. Thanks for that, I was kind of doing a comparison on my own at newegg between what the differences are, but I didn't get a good sense of what should stick out. Thats a good summary. 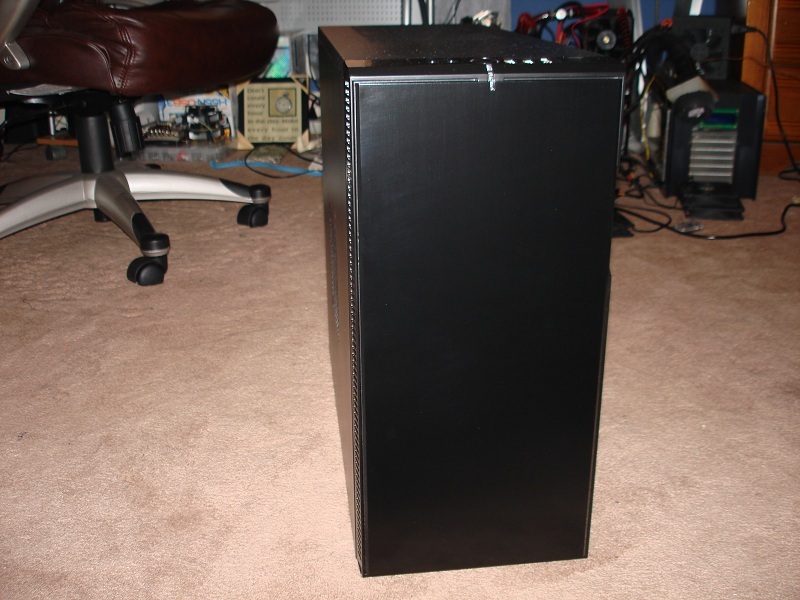 Have you compared much against the Antec 900? You don't have to do all my work for me. :D But I'm just looking at this cases features and good price, and trying to think of what else is popular in this price range. If this was their plan to establish themselves in the US market, it is looking like a really good initial entry. 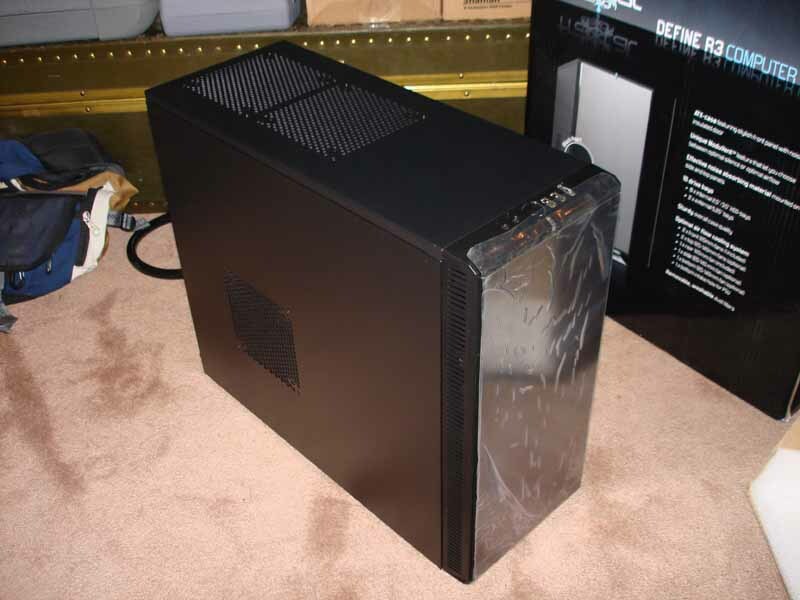 I owned the original Antec 900 for a couple of years, and I like this case A LOT better. I'll look into the details to make sure I haven't forgotten anything, and I'll post my opinions on the 900 as well. I could check out the 902 as well, I'm not sure how much better it is than the original. 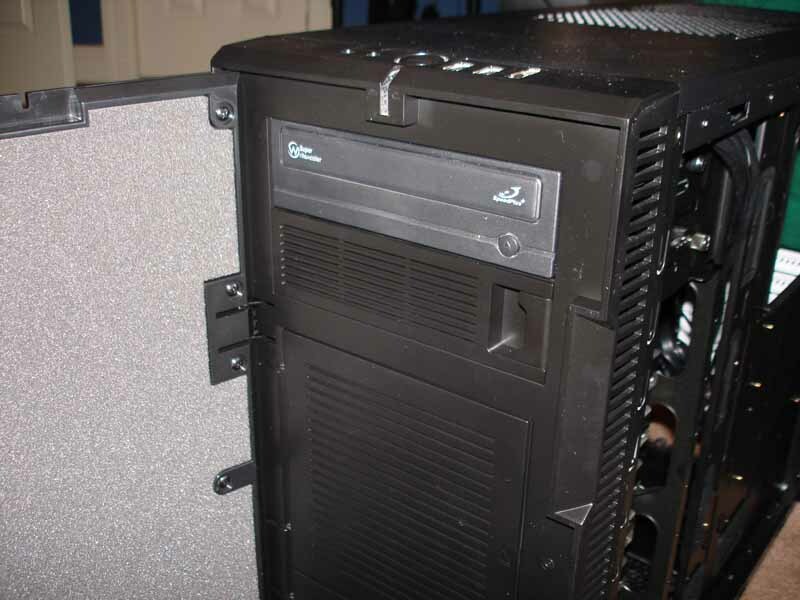 The comparison to the original 900 is pretty much exactly like the comparison to the HAF932 above, except the 900 doesn't have enough cable management holes or a cut out for CPU cooler installation in the motherboard tray. 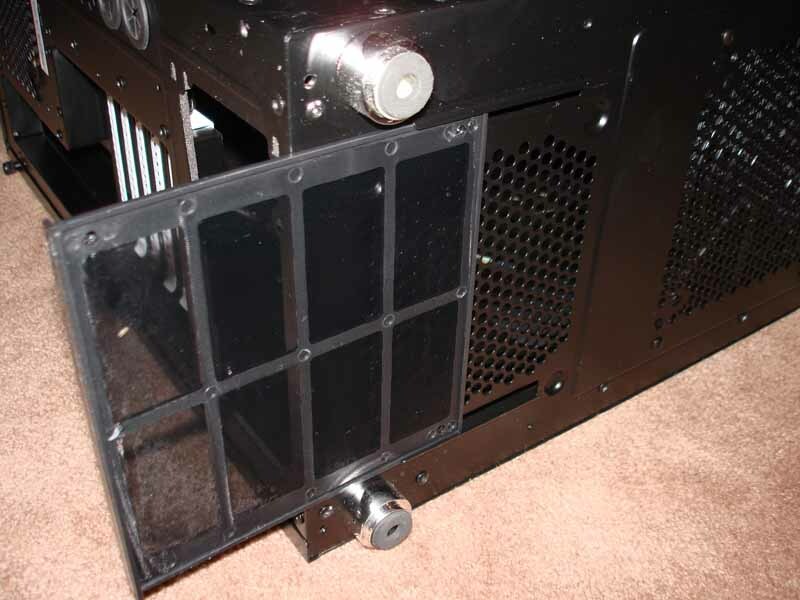 The 900 does have a "L-M-H" fan speed control switch on all of its case fans. The 900 can be had for a lot lower too though, $100 shipped ($80 shipped AMIR). When I bout the 900 I got it on sale for $55 shipped. The Antec 902 looks like the direct competition to me at $130 shipped. The only difference between the 902 and the 900, that I see, is that the 902 has the black interior and a huge cutout in the motherboard tray for CPU cooler installation. It still seems to be missing a hole close enough the the PSU so you can optimize your cable lengths. 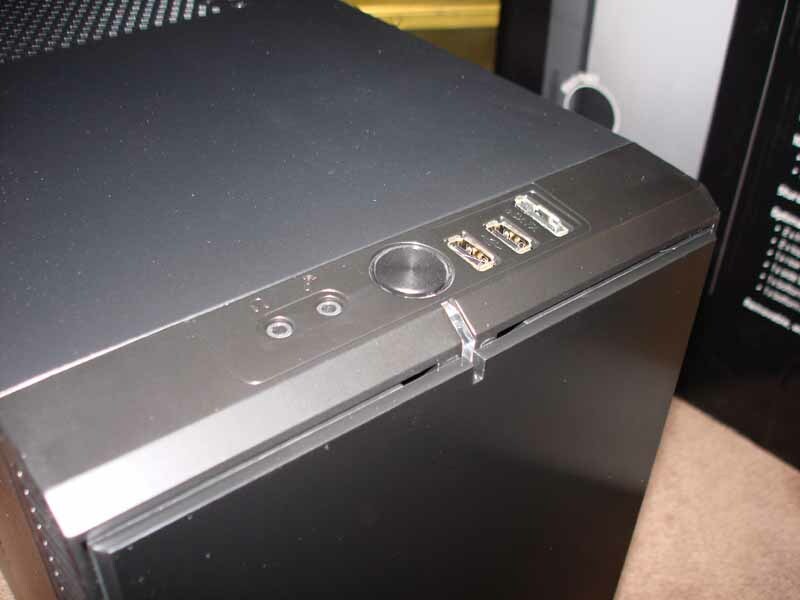 The 902 uses silver/chrome screws and screw requiring a screwdriver on the PCIe slot covers, but those are minor details. So, the comparison between the 902 and the R3 is a lot like the R3 vs HAF932 comparison as well, except remove black interior from the R3 list and replace with better cable management. Example: On both the 900 and 902, the hard drive SATA/Power connectors stick out towards the motherboard which could cause issues with some GPUs. 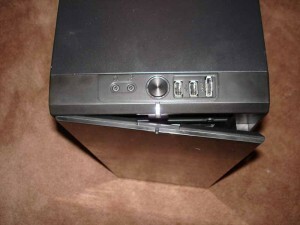 Plus, with the hard drive connectors towards the right side panel like in the R3, it makes for a much cleaner look. It's a great case, you won't be disappointed. 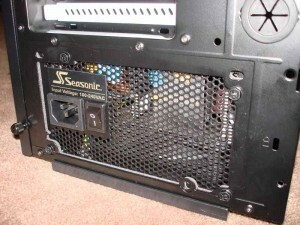 That fan controller is a beast considering it's included with a case. I've had this case here in Australia for a year now and can't say I've any gripes. I don't think not being able to close the door with a fan controller with knobs is an issue at all. There are decent and reasonably inexpesive touch screen controllers available. I use the NZXT Sentry 2 in mine. 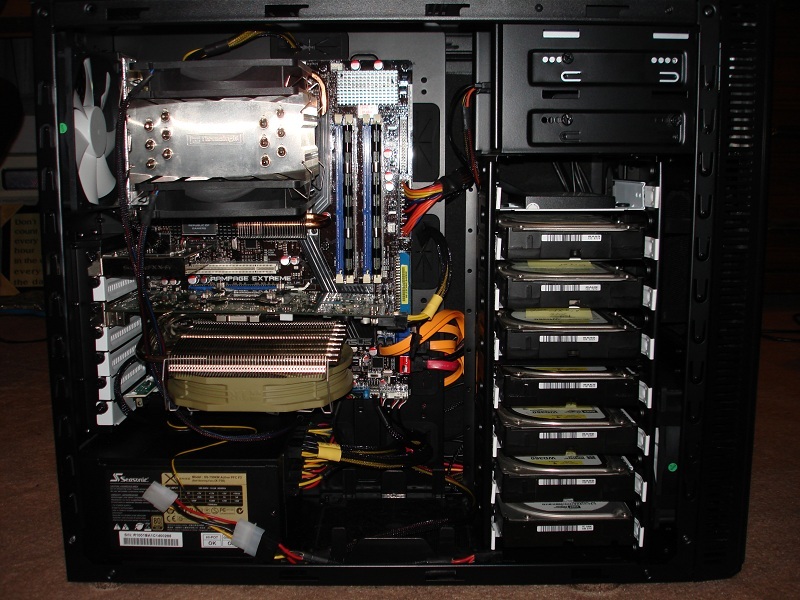 Likewise, do you really need more than 1 optical drive? 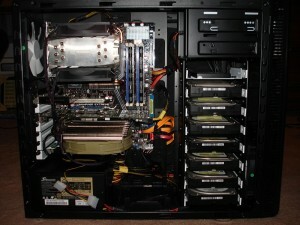 Having said that, I think the case had far more HDD bays than will ever be needed so an extra 5.25 bay wouldn't have hurt. 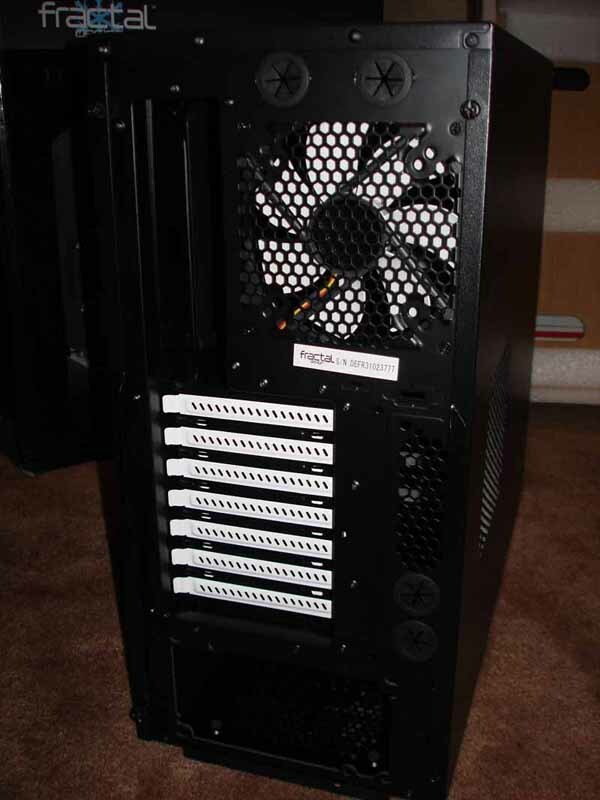 The case is nice and quiet and has great airflow. The good old Coolermaster Sileo 500 is quieter though using that case while gaming in summer tends to lead to overheating. The Fractal Design Define R3 is as far as I'm concerned the best case on the market when silence and cooling are important to you. Had one for about 2 months now. The airflow is not great with the stock fans but I added a couple of Gelid Wing 14s at bottom and top and it's great now whilst still quiet. Especially installing a fan at the bottom, blowing straight onto the graphics card, has a significant effect on temps. Very happy with my purchase and would highly recommend. I just finished my 3dr build in this case. Being a die-hard Lian-Li fan, There's no comparison (dollar for dollar) because of airflow configs, wire management, and sound deadening. Bang for the buck is very high on the Fractal also. I would like to see them give at least one more 5.25 bay though. My builds have one BluRay and the USB 3.0 adapter in the front. 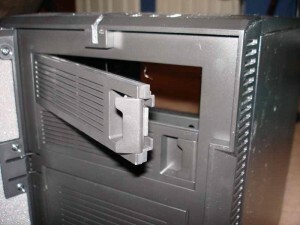 I would also like to see the side panel clips made a bit more HD. They bend too easy for my liking. You can see them here. 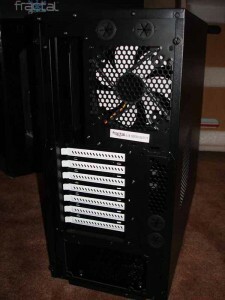 Adding more fans will definitely put this case over the top. 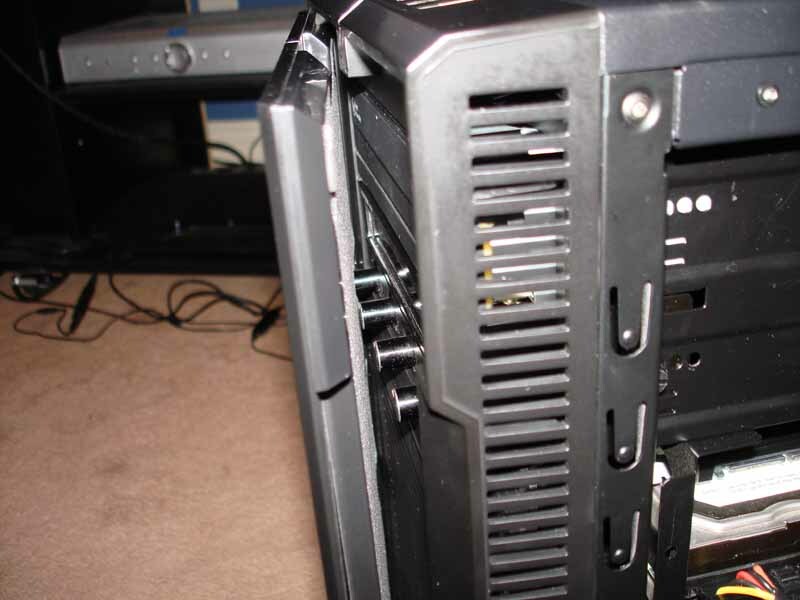 I can see how those clips could bend, but I didn't have a problem with them in my limited use of the case. Yeah, one more 5.25" bay would be nice. It's not like you would lose a HDD/SSD spot since you can use an adapter. Thanks for your input, it seems our opinions on the case are very similar. I'm still having a hard time believing I'm paying 110 bucks for this case. Again thinking back to my Lian-Li's. 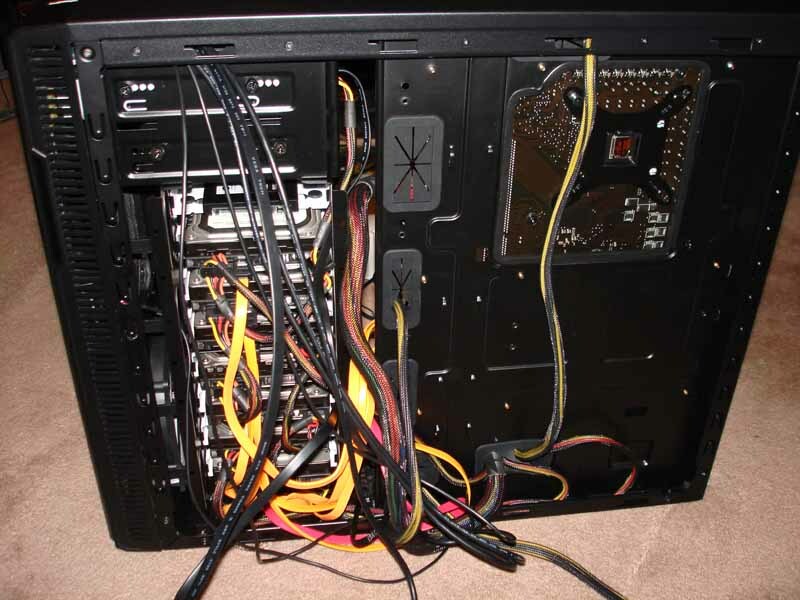 This is only case I have not used fan controllers on too.